I was lucky enough to participate in this one week course called Social Venture Design by the Indian Institute of Human Settlements and Acara Institute, University of Minnesota, here in Bangalore. During the course, I got to discuss our grey water recycling system with experts as well as people who share similar interests. It was a very inspiring and motivating week. At the end of the week, Ashwin and I decided it was time to "show" our grey water recycling experiment to the rest of the world. (We believe in Open Source!) So, here it is. Complete, with instructions. 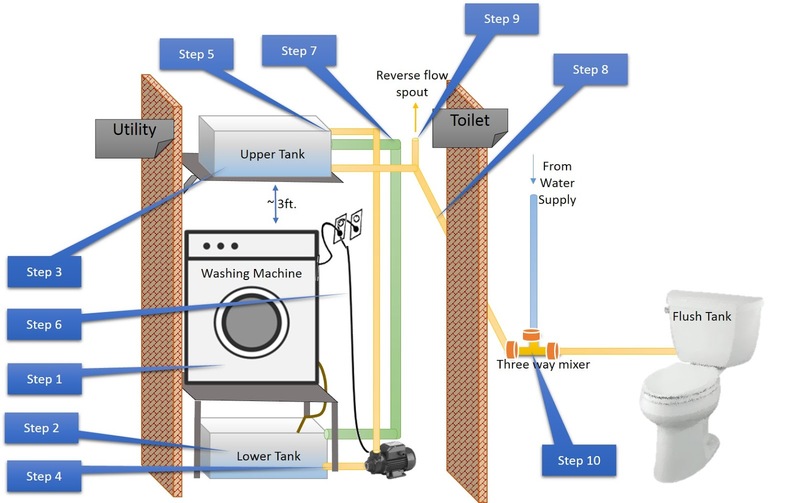 It is well known that washing machines consume a significant portion of a household’s fresh water use, which is typically sent directly to sewerage system. However this water, which is essentially soap and dirt with water can be used for flushing in toilets. What is described below is for a fully automatic, front loading washing machine, like ours. It can be adapted to other washing machines as well. 3.There is space to place the lower tank near the washing machine. If it would be placed below, a clearance of about 1.5 feet would be required. 1. Place the washing machine on a flat pedestal either made of stone or metal. The pedestal should be able to withstand the weight and vibration of washing machine (any mason / fabricator will be able to make one as per this requirements). The area of the pedestal should be bigger than that of the tank, so that tank can be placed below. Ensure the washing machine has access to fresh water inlet after placing on pedestal. 2. Place the 1st tank(lower tank), below in the place created. 3. At about a height of 3 feet above the top of the washing machine place the platform for placing 2nd tank (upper tank). 5. Drill a Hole in Upper tank to allow the outlet from pump to flow into it. Place a filter at this place. Place the outlet pipe (1” diameter) from the pump and connect it to Upper tank which has been placed above, make sure inlet to Upper tank is towards top edge of tank. 6. Provide power outlet and connect the pump to it. 7. On top of upper tank drill a hole and insert the 1.5“diameter pipe, and connect it to lower tank. This is to handle overflow situation in the upper tank. More water flows down to the lower tank. 8. Draw a pipe (1” diameter) from the top tank ( as close to bottom edge) and provide and outlet near the toilet flush, this may vary from house to house and will need the help of plumber to place this. As the two units are separated by a wall, this is a direct, single pipe connection. 9. Provide an outlet pipe at the cross section of this pipe with upper tank. This is important. In case of blockage in the pipe due to air or small sediments, by pumping water in the reverse direction, the block can be forced out. 3. When you are not running washing machine, (i.e. when the upper tank is empty) turn off the waste water supply and turn on fresh water supply. So, there you go! Please do let us know what you think of it. And if you'd like us to help you install this system at your house, you could write to us. And we could "take it offline".